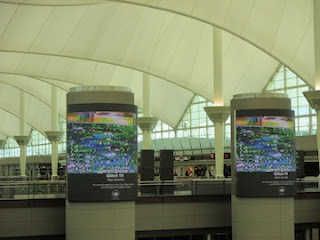 A series of four of my short video artworks are now on exhibit at the Denver International Airport. Where exactly in the airport are the videos playing? Well, you can't miss them. They are located on the two large cylindrical towers in the center of the airport's main building. The moving images are playing on the two huge wrap-around screens provided by Clear Channel Airports in collaboration with the airport and the artist. The artworks featured in this series are made especially for the airport's art and culture program. Titles include "Glitch TV," "Data Falls," "New Aesthetic TV" and "Second Nature." In discussing these new artworks featured in the airport, I was quoted as saying that "[t]hese works grow out of my recent exploration into the relationship between data flow and the flow of life. Sometimes life can be perceived as a rather normative experience but one that is boring and predictable, while at other times our daily perceptions can be glitched or altered by the digital devices we depend on for our communication and information gathering. For example, what if the delivery of high definition data streams start breaking up and creating colorful artifacts you have no control over? One response would be to become impatient with the technology as it dysfunctions right before our eyes. In fact, these disturbances can be visualized as little or even big glitches that at first may seem a nuisance but, on second look, from an artistic perspective, are actually more interesting than the clear signals we're used to seeing in commercial culture. This is what I explore in my ongoing investigation into glitch aesthetics." A short video of the exhibition can be found here. These shorter videos grow out of my recent investigation into glitch aesthetics as featured in my last major work of net art, Museum of Glitch Aesthetics (2012), a major art commission sponsored by Abandon Normal Devices and the Harris Museum in conjunction with the London 2012 Olympics. The artist wishes to thank Matt Chasansky, the Denver International Airport Art and Culture Program and Clear Channel Airports for sponsoring this exhibition. "We're not into making things mean something so that some cultural analyst can interpret our work for us. That's too narrowly focused." "We would rather just let our work live, out there, say, on the Net, and let it circulate freely, a kind of becoming-transmission." "It's more about how the movement of aesthetic forms creates a mobile net aesthetic which produces a vibrant social texture to get lost in." "The idea of circulation, of intervening in the transmission process, is related to the field of distribution as an aesthetic form." "It's not about - 'if we build it, they will interpret us' [and then we will monetize it] - it has more to with us moving in social space." "We're playing with the archive in an ahistorical or transhistorical style, not academic or even theoretical per se, but as speculative samplers falling in and out of undulating ensembles of remixologists performing in auto-affect mode." "It's strange - we track the co-poietic unfolding of network distributed aesthetics as a kind of embodied praxis. The idea is to resist the defeatist retreat back into the ready-to-be-psychoanalyzed 'self' per se while seeding new forms and tempos of living itself." "We study ephemeral forms the way a painter might draw or do a quick napkin study that then leads to a large-scale painting or sculptural object. For instance, we'll challenge ourselves to embody a rhythm in a fast-moving game environment just to see what it feels like to create and satisfy needs based off that team's particular game design aesthetic, and then we'll take that rhythm and try to superimpose it on something completely distinct from it, like reading a dense theory book during our 'free time.'" "When we scroll through a city and make unconscious links with the terrain as if becoming 21st century psychogeographers, we'll simultaneously begin re-mapping our aesthetic trajectories -- so that circulating in a neighborhood becomes our version of a performance art project focused on duration and the ability to intersubjectively relate with the denizens of the micro-culture we're immersing ourselves in. You could say that our art cannot be located in the objects that we construct and that contain our potential legacy if only historians and critics and curators and collectors could unlock the secret meaning stored within . . . in fact, our art is really more like Duchamp's register of the 'anartist' -- the not-artist -- and yet there's still no getting away from aesthetics, from the desire to assemble systems of circulation and internetworked communication and distribution that layer our experience with something well beyond meaning. It's much more textural and could be better described by words like 'disgusting,' 'stimulating,' or "optimum flavor profile.'" "Another way of putting this would be, 'Experiencing the ecstasy of transmission is an intuitive process that, when informed by the edges of an applied aesthetics, can turn into realtime reality hacking."